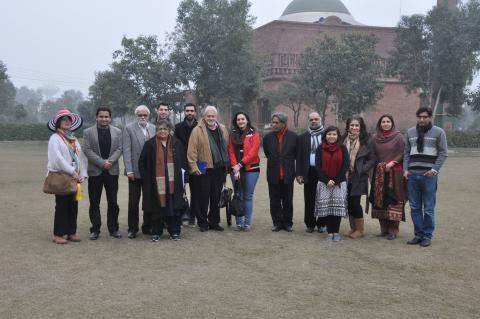 In January 2015, Professor Hasan-Uddin Khan (Roger Williams University) conducted a week-long workshop in Lahore for the faculty of COMSATS Institute of Information Technology architecture programs (Lahore and Islamabad campuses). The objective of the workshop, titled “An Integrated Approach for the 3rd, 4th & 5th Year Design Studios”, was to improve the quality of studio offerings and pedagogy in the Departments. As part of an ongoing plan for the B.Arch Program of faculty and curriculum development. The workshop was attended by twenty faculty members from the two campuses, including the new and former Deans, the Department Heads, and the Senior Advisor. The workshop was one in a series to review improved courses, which have been amended; consistent with the recommendations made to COMSATS in August 2014 by the External Advisory Board (EAB) of which Khan is a member. He also gave a public lecture at the Alhamra Center on “Cutting Edge Architecture in Asia” to some 150 members of the Institute of Architects of Pakistan. It is expected that another workshop involving the EAB will be held in May or June 2015, concentrating on teaching and delivery systems for the revised courses – a teachers training workshop.